When we first saw them building this coffee shop we were so excited because it meant there was finally somewhere local to go! If we want to go to a cafe we have to travel by bus for 20 minutes to Jinju. Not something we can do all the time. There are technically two other cafes in this area, but one of them is dodgy and overpriced, and built next to a rubbish dump! It’s not really a coffee shop and doesn’t have that atmosphere. You have to go up stairs to the second level and apparently the owner does “face reading” (fortune telling by looking at someone’s face) as well. There is another cafe that is small but decent, however it’s still not the Korean coffee shop vibe that we like in cities. So of course we had to explain what dabang coffee shops are. They are everywhere! No thought to design or atmosphere, it’s usually just old tables and chairs in rundown buildings. Not all, but a lot of them have varying levels of prostitution. They deliver coffee and only hire women, so the deal is that men who order coffee can also pay for something extra. The line of what is prostitution in Korea is so blurry. Things vary from women being paid to talk to men while serving them to of course all the way through to selling their bodies. Some dabangs have rooms upstairs for that. That’s why it’s mostly old men at these places. Prostitution in Korea is everywhere but everyone turns a blind eye. So you can see why we don’t ever go to those types of coffee places. Those that watched the drama Modern Farmer might remember a scene where the woman opens a Ediya coffee shop in town. Ediya being a big proper coffee shop brand, but two men come in and one grabs her, insinuating that he wanted more from her. Completely disgusting and unacceptable behaviour in a real coffee shop (or anywhere in my personal opinion), but not completely unrealistic if you know what it’s like in countryside areas. This new real coffee shop is such a good thing here! There is such a community vibe to it and it’s been wonderful to see that many older women have somewhere to go and talk. The prices are half what city prices are but it has free wifi and all the stuff you expect from city cafes in Korea (wonder if I can get them to add chai latte to the menu though). Something that is sad about living in the Korean countryside is that a lot of places are dying. Our village certainly is. Young people have all moved away. But Wonji, the town next to us is actually growing. It’s a beautiful location, apartment prices are cheap, so young families are moving there to live. This coffee shop opening is a symbol of life coming back to this area. Living in the countryside definitely makes me appreciate the small things in life. Also, the coffee shop is run by someone in the Gwon family, so a distant relative of ours. Hugh complained that he wanted a discount but I think if the coffee shop gives out discounts for all Gwons they would have to give discounts to pretty much everyone here… many many Gwons in this area. He likes to think I’m such a baby and so helpless so it’s funny to turn it back on him. Also it’s not just about being forgetful, it’s because once I’ve got my shoes on, I can’t go back inside! I’m not Korean and haven’t mastered the getting shoes on in 2 seconds thing. It’s such a hassle having to take my shoes off again, go back inside and get whatever I forgot and then put my shoes back on. In Sydney we had a no shoes inside rule as well, but we’d ignore it if we had to run and get something quickly. I’ll get in big trouble if my inlaws see me do that though. We still have a few vlogs from when we were in Australia. We’ve been a bit slow editing them, but here is when we went to SBS PopAsia for an interview and then had dinner with Han and Sophie and Alice. My mother in law only knows about Kpop because of me. So what she knows may be a little bit YG biased. New Nicholalala Webtoon episode up on Line Webtoon! READ REST OF WEBTOON HERE. This episode is a new one that has not been on the Challenge League. If you think you know the story of how we met, THINK AGAIN! If you like this webtoon and want me to continue, it really helps me out if you like, share, comment. You can also give me a rating if you haven’t already. You guys have kept me in the Popular Section in the top 10 of Slice of Life category, so thank you so much! As I’ve mentioned before, Hugh’s sister is back from her working holiday in Australia. 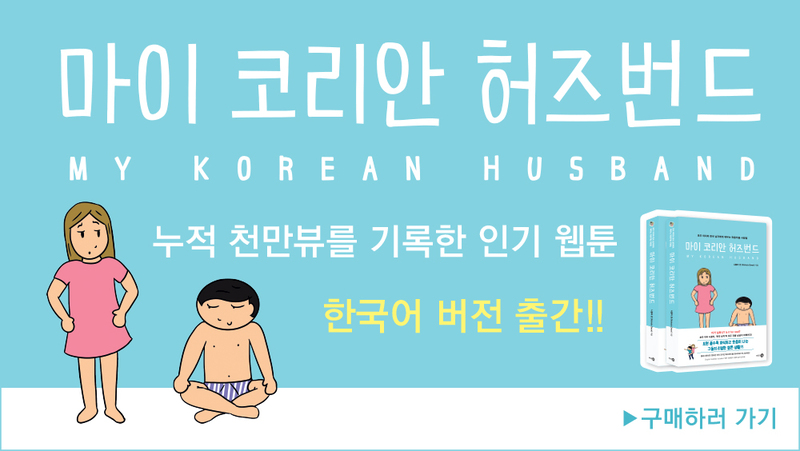 It’s normal for women to live with their parents until they get married in Korea. Hugh’s sister gets married in a few months so he only has a little bit more time to torment her at home, but he is making the most of it. All the bugs are back now that it’s getting warmer. I hate it! They are just so annoying. I swear that Korean flies and spiders and bugs are just way more annoying than Australian ones. Korea is an awesome place, but how some people in the international Kpop and Kdrama communities talk about Korea can more harm than good. Of course Korean tourism plays a part as well. We’ve heard of people coming to Korea and expecting to meet a rich handsome guy exactly like in a drama and when that doesn’t happen, they go back to their own country angry and disappointed and hating Korea. We get a lot of emails and messages, and many of them are worrying to us because of the high pedestal some people place Korea on. I know that many of you have a very balanced view of Korea, so you might be surprised that there are people with such extreme ideas about Korea, but we are seeing it more and more. In particular, I think people from countries where they may lack a sufficient education are particularly at risk, as they lack the skills to research and understand on their own. It’s easy to get caught up in the glitz and glamor that is presented internationally about Korea, which can lead to disappointment in the long run. For international Kpop fans, they may be surprised to hear how little people actually listen to Kpop. There are the huge groups that people know about, but mostly Kpop is for teenage girls, and even then those girls will have one favourite group, not several. It’s odd to many Koreans when they see international Kpop fans liking so many groups at the same time. It may be hard for some fans to hear but your favourite Kpop group may attract very little attention in Korea. That’s why some Kpop stars go onto TV shows, because it’s a much bigger platform for them to attract attention that may trickle down to the Kpop group they are in. That’s not to say that there is no Kpop in Korea, you’ll hear it all the time, being played in stores and you’ll see the bigger groups in advertising and of course you may have the chance to go to a concert, but Korea is not magical Kpop land. We talked about many other things in this video but had to cut a lot. One thing we had to cut but will talk about later is how the international community talks about Korean military service and the problems with that.